Twitter’s stock reached an all-time low today after an earnings report yesterday that beat analyst expectations across the board except for where it really mattered: monthly active users (MAUs). 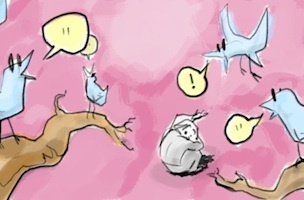 Twitter’s MAU count now stands at 255 million users, which means it’s risen just 23 million users – a whisker under 10 percent – in the last six months. As a comparison, Facebook has added 87 million MAUs over that same period – 48 million in Q1 2014 alone. And that’s all gravy for Facebook, as it already has well over one billion actives. 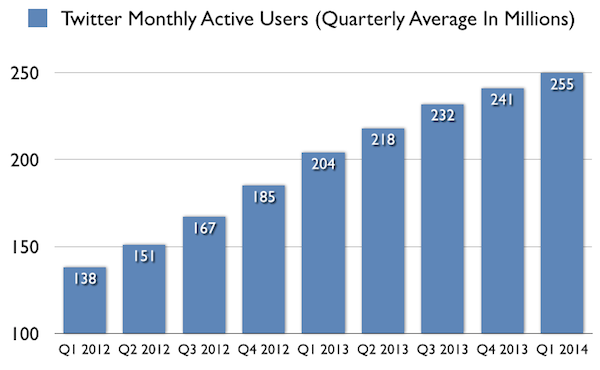 Here’s a chart showing Twitter MAUs since Q1 2012. 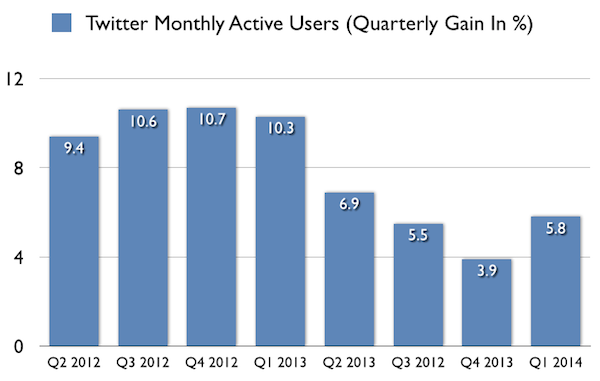 And here’s a chart showing how many MAUs Twitter has gained each quarter, as a percentage, since Q1 2012. As you can see there’s a nice recovery uptick in Q1 2014, but that wasn’t enough to satisfy Wall Street, with some analysts expecting at least 256 million MAUs. 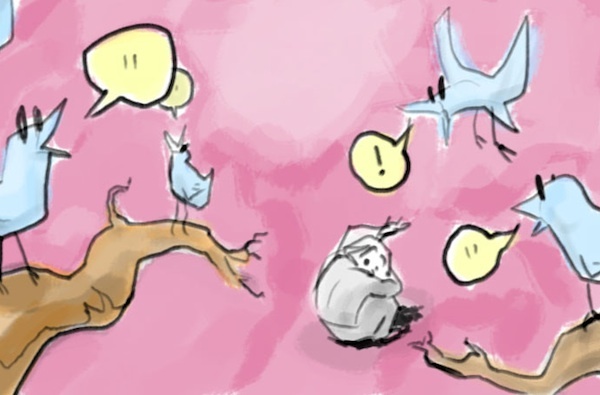 So Twitter fell a million short, which seems small, but the overall problem is that Twitter has a problem, and it’s two fold: it can’t sign up new users at a fast enough rate, and many of those it does attract don’t continue to use the service. Going forward, this is a major sticking point for any business that is pinning so much of its future on selling ads: selling them to whom, exactly? Veteran users don’t want to see ads in their timeline and new users aren’t sticking around long enough to see them. Which means Twitter is going to have difficulty convincing brands to advertise unless it’s at a rock bottom price, which is seriously going to undercut projected revenues. Twitter has launched a ton of new products lately and had a big profile revamp, and it will be interesting to see if any of this has a positive impact on user acquisition come the Q2 numbers. In the meantime, where the stock will be heading into that release is anyone’s guess, but I can’t think of many reasons for it to move higher in the interim.